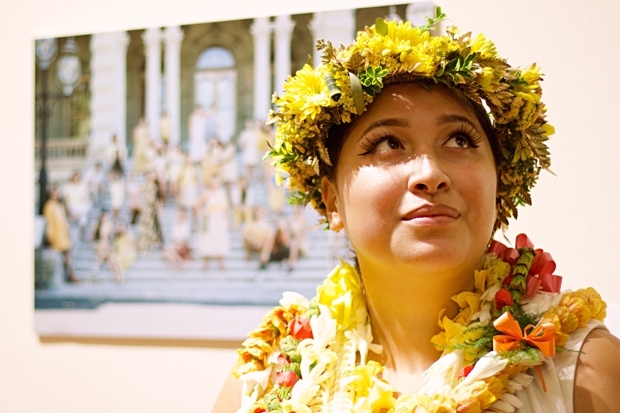 Wainani Paikai stands in the lobby of the Honolulu Museum of Art School wearing half a dozen yellow and white lei, crowned with a haku of yellow chrysanthemum. As the museum’s special events coordinator, it’s not unusual to see Wainani greeting visitors and colleagues at an opening, but this time, she is off the clock. It’s Oct. 12—the opening reception for Unity in Color Honolulu, a photography exhibition she organized as part of an ongoing international photo project. And it also just happens to be her 25th birthday. “Unity in Color is a photo series that Jasmine Solano started in Los Angeles earlier this year, as a precursor to the Women’s March on January 21,” Wainani says. “It features women of color, and focuses on intersectional feminism.” On the wall behind her are portraits of a diverse group of women—including several museum staff members—wearing shades of yellow, beige, and brown, posing on the steps of ‘Iolani Palace. Wainani organized the one-day photo shoot that took place July 30, 2017, with photographers Shaneika Aguilar and Michelle Chen. Museum staff on the steps of ‘Iolani Palace. Photo by Shaneika Aguilar. Since Solano, a DJ and television personality, shared the first Unity in Color images with her 22,000 Instagram followers, people like Wainani have spearheaded similar photo shoots in almost 20 cities around the world—some featuring only young feminists (under 21), or even groups of men. 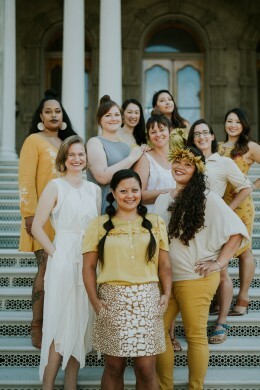 Solano thinks of Unity in Color as more than just a social media campaign or a reason to dress up and take photos, but a way to build community around discussions of women’s rights. “I believe this series can serve as a universal tool to bring people together that are feeling disenfranchised, unrepresented or at a loss for hope,” says Solano. Though discussion panels, performances, and other events have been organized around the photo series, Honolulu is the first city to host an exhibition of prints. Behind the scenes: Michelle Chen captures photographer Shaneika Aquilar composing a group shot. 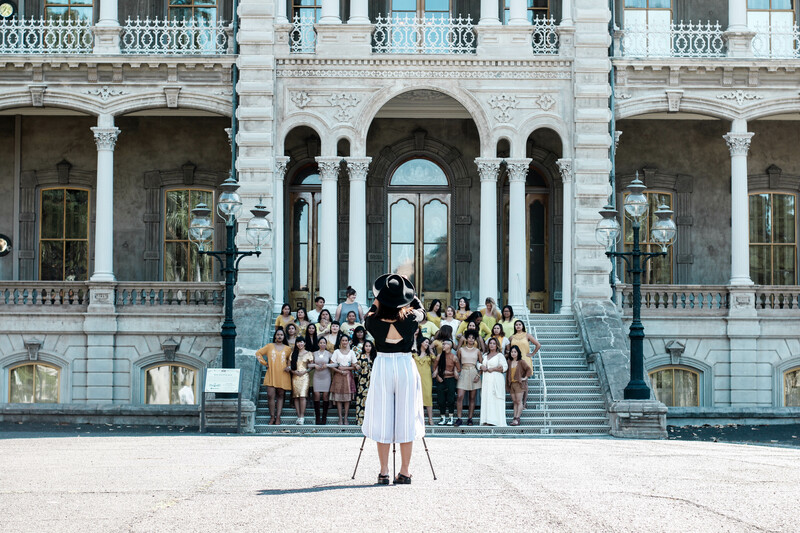 Unity in Color Honolulu, featuring photographs by Shaneika Aguilar and Michelle Chen, is on view at the Honolulu Museum of Art School through Oct. 23.